This project was slow, occasional and drawn out. 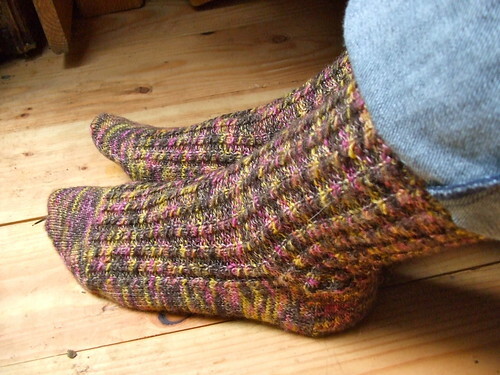 It was my first completely successful pair of socks constructed two at a time using magic-loop, and I got a little overwhelmed coming up to the heels. I also had a busy spring, with plenty of time consuming stressful obligations, so knitting fell a bit by the wayside. What I might love the most about knitting (other than the knitting itself, which is totally zen and essential to mental health) is the way each project absorbs certain memories. One pair of socks can contain a hundred individual little vignettes from every day and not-so-everyday life. It’s like journaling, but more tactile and much more useful. 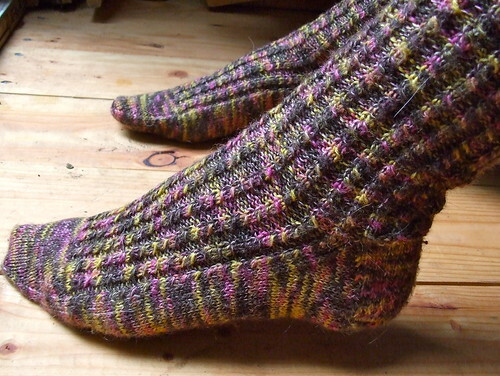 So, the Sugar Maple socks. Firstly, this is not new yarn. We’ve been saving our money aggressively and I haven’t bought myself new yarn in months (pat-pat on the back). 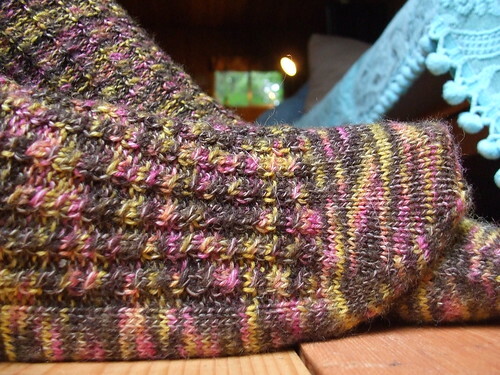 This skein was actually the first sock yarn I ever bought…I think it was Spring of 09. This was when socks still seemed daunting and honestly a little strange. Why would you spend so much time knitting something at such a teeny tiny gauge, only to stuff the whole thing inside of your shoe? And why so many brightly colored, strangely-hued variegated yarns? I am a lady who appreciates clean lines and large blocks of complimentary colors…the chaotic mixing that happens in sock yarns was almost too much for me to handle. As I learned quickly after picking up my first pair of needles, knitting has a way of fundamentally altering the way you look at color…but I still hadn’t quite found myself accepting the look of variegated yarn. I came around to the idea of socks themselves last Spring. I was reading an issue of Interweave knits and the little narrative section near the back was on the subject of socks…in particular it detailed the author’s metamorphosis from casual knitter to full-blown knitting on your lunch break, riding on the bus sock knitter. Her description of how emotionally satisfying a pair of socks could be finally made me understand what the appeal really was. So on the way home from the cabin, I stopped at the yarn shop in Anacortes and grabbed a skein of sock yarn. It was Zitron Hand Art Flame…in this lovely/hideous yellow, pink, olivey/brown colorway. I took it home, wound it into a ball, and promptly buried it in my stash. Apparently, though I’d made an effort, it was going to be a while longer before I accepted this variegated monstrosity as something worth knitting up. Fast forward to this Spring. I am a full-on sock knitter. I carry my knitting around with my when I move from place to place on Guemes…the yarn shoved in one pocket of my hoodie and the needles in the other. I’ve quit smoking for good, so I take my socks to the bar with me, secure in the knowledge that I won’t be rubbing my smoke fingers all over the yarn. I cast on for these socks at the boat, where I was covering for Jonah while he and Pete worked at the cabin, putting a new roof in. I worked on them in the mornings and evenings, before Jonah and I set to work tearing up the floors of the cabin, pounding down nails and filling them with wood putty…sanding the planks and replacing the rotten spots with new wood. At first the going was slow…the pattern is a mock cable rib and knitting into the back of a stitch and then the front can be a little dicey if you’re not used to doing it. My hands had to warm to the particular amount of pressure and tilt required to pluck the stitch without splitting the yarn or grabbing the wrong loop. I took these socks to Camano Island to visit my Great-Grandpa, who told my sister and I all about his twenties on Capitol Hill, when he worked at a diner and served waffles to friendly prostitutes. I showed my knitting around and my mother showed off the laptop cover she made for her Macbook. I oohed and aahed and she promptly slipped it off her computer and onto mine. Thanks, mom. I took the socks up to Camano again after Grandpa passed away, to visit my Nana and watch episodes of Castle while she fell asleep on the couch with her barrel-chested chocolate lab in her lap. That’s where I turned the heels, and I only had to knit backwards once, when I tried to do something fancy during the big murder-mystery reveal at the end of an episode. I got sick for the first time in years this Spring, and I spent the down time watching episodes of Fringe and Lost and working away at the gussets and the foot. I finally reached the toe last weekend at Guemes and started the final decreases while I was sick for a second time on the couch. I alternated knitting with reading a Michio Kaku book about inflation and string theory. I woke up yesterday and spent about 20 minutes finishing up the toes and weaving in the ends, before Jonah got home and we climbed in the car to come up to Guemes one last time together before he heads off to Alaska on the 16th. I’m wearing the socks right now, while it rains outside. It’s unseasonably cruddy today, but I don’t mind too terribly since yesterday was beautiful. Elise had a birthday party at her place by the tide flats and we ate amazing fresh corndogs she made at Anderson’s after she got off work. Posted in Domesticity, KnittingBookmark the permalink. Stripes and Stripes and Stripes…Minimalist-ish.